I have been a long time user of Microsoft Office. I used both Word, Excel and Powerpoint in both college and university and in my subsequent employment as an accountant. I purchased a new laptop back in May and it didn’t have my beloved Microsoft Office and I can tell you that I really really missed it! As a full-time blogger, I need both Word and Excel to function. It was a big pain trying to make do without it. I nearly jumped through my computer screen when approached to review Microsoft Office 2010 Home & Business! It was funny because John and I were talking about purchasing it that very week. Perfect timing! With Excel 2010, you can do all your household budgeting with the ready to use templates and be able to easily gain insights from the data. If you are a visual person, you can use colourful graphs. Excel 2010 has two new features: Sparklines to create small charts that make it easy to highlight trends in data at a glance, and improved Conditional Formatting to highlight specific items in your data set with just a few clicks. With OneNote 2010, you can organize all your household information into one spot. For instance, you can keep track of a remodel of your home. You have a access to documents, text, videos, audio, screen clippings and more all in one spot. Keep OneNote 2010 open when you are searching online and take notes. When you need to remember where your ideas came from, the Linked Notes feature enables you to jump right to the source of your information with just a click. With Word 2010, you can create professional looking letters, resumes, reports, etc. With PowerPoint 2010, design presentations if you have to speak in front of a group of people. You can edit photos with the Picture Editing Tool which allows you to crop, control brightness, contrast, etc without ever leaving the program (same goes for Word 2010). You can also edit your videos in PowerPoint and make them shorter and reduce the file size as well as being able to adjust colour and various special effects. The ones I use the most are Word 2010 and Excel 2010. Word I use mainly for writing my blog posts. There are so many options available to you that I know I don’t even get a chance to use half of them. For example, you can customize the font, colour, size, etc. One thing I didn’t realize you could do was do Photo Editing! I added in pictures of my kids and made them black and white. You can do so many special effects with your pictures. It reminded me of those stores that take a photograph and then make it look like a painting. I did that on my own with Word 2010! Who knew! I thought that was just the coolest thing…this might bring out the more artistic side in me. Hey, I can make my own Christmas Cards this years! I LOVE Excel 2010. I used Excel constantly at my previous job. It’s a MUST when doing any kind of accounting work or even working on your yearly taxes. I am a list person so I make new spreadsheets for whatever project I am working on. It is handy to have when doing reviews because I can keep track of the products I received, the date I received them and then the date the post went up. I can highlight the ones that are done and sort by date the order they need to be posted by. John and I also like to keep a budget and we use Excel to keep track of our income and expenses. I had never tried or even heard of Microsoft OneNote 2010, but it’s a very valuable tool as well. It reminds of a book I used to jot down info as I come across it. Instead of writing it down, you would record it in your own Personal Notebook. It is much easier to find what you are looking for by doing a search rather than having to look through page after page of a physical notebook (been there done that). You can use OneNote to hold all your recipes and easily add new ones when you find them online. I am always coming across recipes I want to try when I read blogs! Microsoft Office 2010 is essential part of my day to day life and I am so glad that I am now able to use it again! It helps me stay orgainzed on so many levels. I highly recommend it for moms, dads, kids and it would make a great Christmas gift! 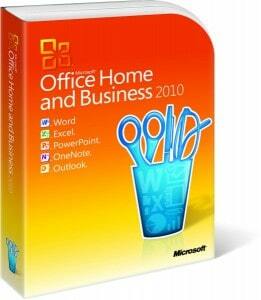 Purchase Microsoft Office 2010 Home & Business for $279.99 online. Just buy and download and it’s very simple to set up. I had zero issues getting started. You can also purchase the other versions- Home & Student for $179.99 and Professional for $499.99. Visit Microsoft Office for more information or to purchase any of these programs. I follow you on Google Friend Connect where I’m known as Auriette. I visited Microsoft Office and my fave product is their Office Mobile! I love Excel. I use it for both at home and work. I’d love the whole suite of applications! Excel is my favorite since I use it on a daily basis! My favorite item in your Open Sky Store is the Salsabol; perfect for parties! Likes Microsoft Office on Facebook.